When the client open their album proof they will see their spreads along with their gallery below (assuming you linked one or uploaded photos) and on the right hand side their comments will appear. They can go back and forth by clicking the arrows on each side of the spread or use the keyboard arrows. When the album proof is opened by the user then the gallery will be loaded at the same time. This is to minimise the waiting time to view the gallery. 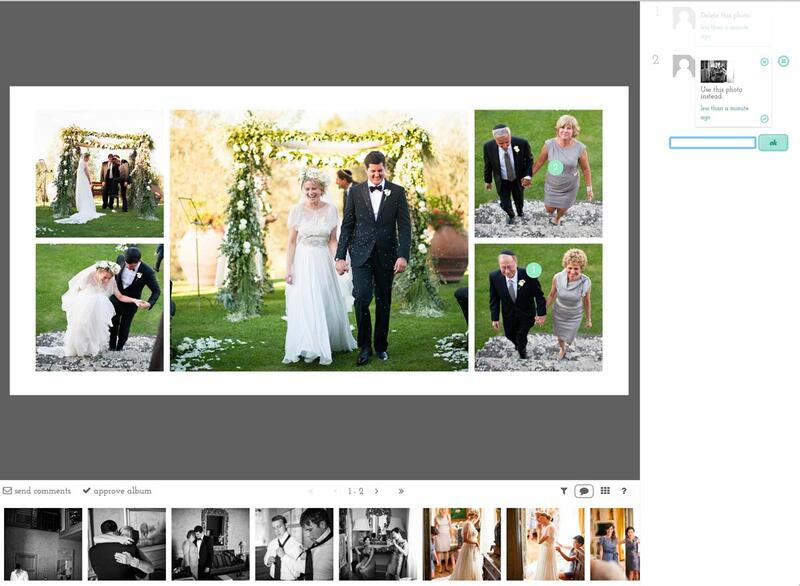 When the user drags and drops an image the file name will automatically be noted down which makes everything easier for the client and photographer when replacing photos. Filter icon: by clicking this it allows you to view only spreads with comments on them. Comment icon: click this to leave a comment (or anywhere on the screen and it will be activated). Overview icon: gives you an overview of all the spreads. This way you can jump from one spread to another really easily. To leave a comment the user can click anywhere on the spread and a small dot will be created at that location. The user will then be able to write their comment on the right hand side of the spread.